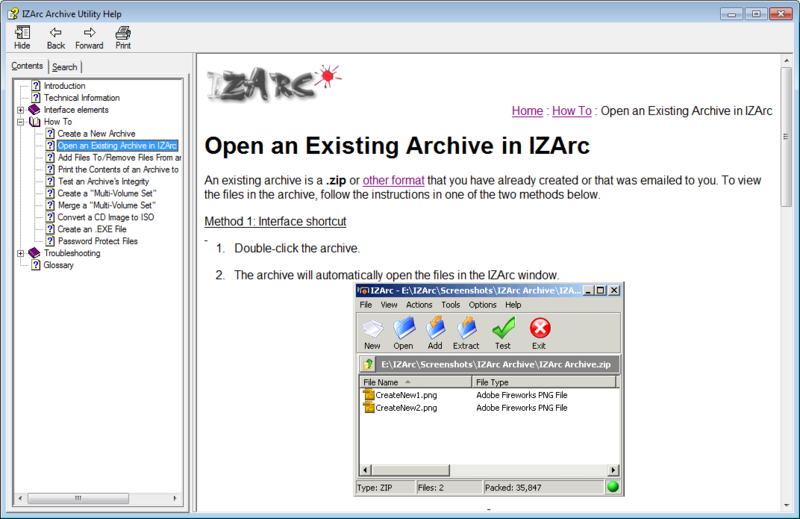 My work machine uses the program IZArc for compressing (zipping) and extracting archives. Some time ago, I was looking for some information in the Help File (a .chm file called “IZArc Help” that comes with the program) and noticed that it covered many topics but that the topics I was interested in (compressing and archiving) contained little useful information. Most of the topics could be considered “glossary” information rather than “help.” Furthermore, the entire Help File didn’t contain one graphic for procedures, or even a graphical overview of the user interface (UI). A help system is a reference document designed to assist users with learning how to use a product or feature. This form of documentation creates the least personal relationship between the writer and user. It is designed to be a quick way for users to find information about the program. Overall, a help system should help users get back to using the program quickly so they can accomplish whatever task they set out to do. Regular users of software often need product support beyond a task-oriented procedure. This information is usually not needed on a daily basis, but must be easily accessible to users when they need to complete task. The use of context-sensitive help in the form on a built-in help system is typically the “first line of help” for a user. Along with my previous video tutorial showing the step-by-step procedure for archiving and password protecting files, I created a sample Help File that covered what I believe would be the most important topics about which a user of this program would want more information. Additionally, I included many UI and procedural images and for the most common procedure, I embedded a video tutorial for opening an existing archive. The procedures used in the Help File are based on version 3.81 build 1550 using Microsoft Windows XP. I used RoboHelp 8 to create the .chm. Click the following link to my Google Drive folder, click “folder contents”, and then click “Download”. 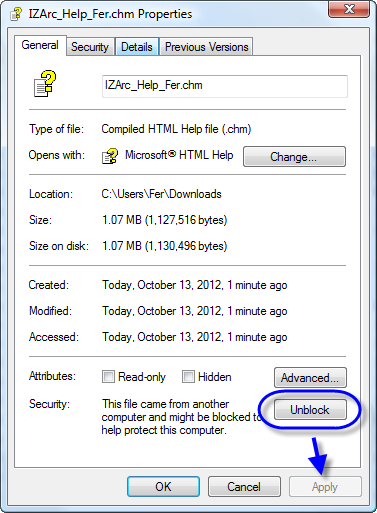 After saving the file to your computer, right-click it and click Properties. At the bottom of the default General tab, click Unblock and then click Apply. *This project was completed in collaboration with Joseph Sass at Minnesota State University, Mankato.